I went out on the front deck earlier, armed with my usual 'treats' for the birds. I had only just stepped towards the railing, when - Whoosh! 3 of our young magpies swooped in and sat on the top wooden railing looking at me expectedly. I had to chuckle - they are anything if not subtle! I broke off a piece of food and placed it on the railing a short distance away from the magpie on my left....he deftly grabbed it in his beak and flew away to enjoy it. The next magpie on my right, who was a bit more shy, was hesitant to do anything like that, but I placed the food anyway--to his left. He just sat and looked at me. 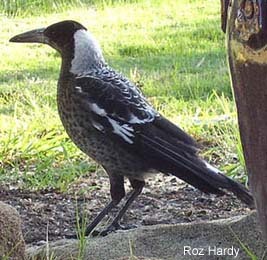 The 3rd magpie was very timid, and was happy that I was also throwing food over the deck to the lawn below - he/she flew down immediately to start his feast, as did the honey-eaters! But my little mate still sat on the deck railing looking at me expectantly. I told him that I would try again, and this time placed the food to his right, and then stepped back 1 step--he almost smiled! He quickly took the food and flew off.....we all have our eating habits--just have to figure out which one suits each bird! What I am enjoying is that Magpies as a species are very territorial, and can get very aggressive when it comes to protecting their 'area'. They have been known to bombdive anyone in 'their area' in order to chase the intruder away. They will peck and cause harm to any intruders, if they feel they are being threatened- they are very protective of their environment.